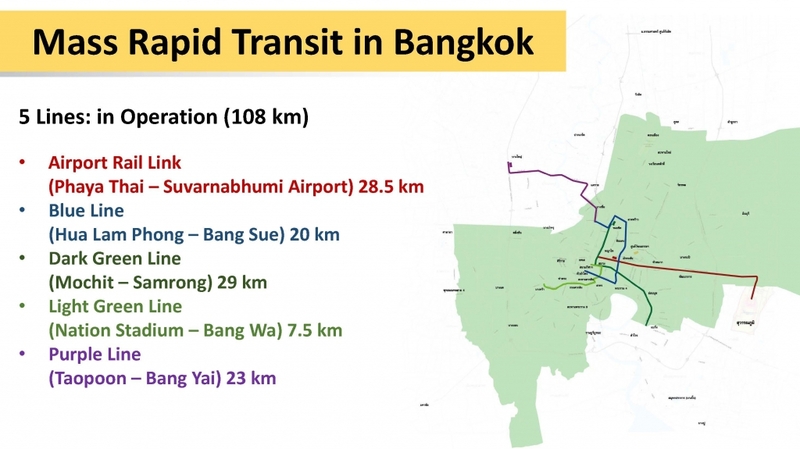 To ensure it maximizes its strategic location at the heart of the ASEAN Economic Community (AEC), Thailand is investing around 1.9 trillion baht under its Thai Transport Infrastructure Development Plan 2015-2022 and Urgent Transport Action Plan 2015. 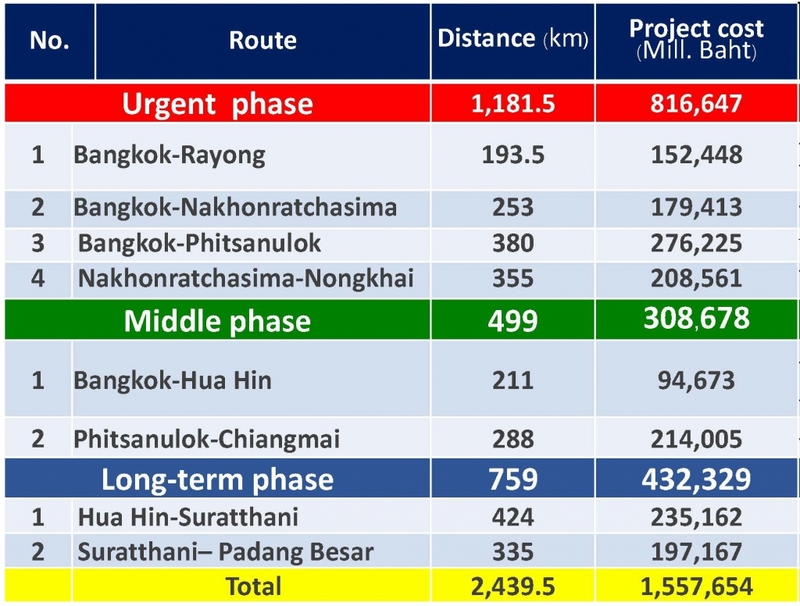 Key infrastructure projects include: 1) intercity rail network development, 2) public transportation network development to solve traffic problems in Bangkok and its suburbs, 3) increase of highway capacity to connect the country’s key production bases with those of neighbouring countries, 4) marine transport network development, and 5) enhancement of air transport service capacity. Thailand has an excellent rail system spanning 4,429 km of railways that constitute a vital link in the transportation chain. The office of the Royal State Railways of Siam was first established under the control of the Ministry of Public Works in October 1890. The State Railway of Thailand (SRT) operates under the Ministry of Transportation and Communications. It is responsible for building, operating, and maintaining Thailand's railway tracks. According to the strategies on Thailand’s infrastructure development in transportation (2015 – 2022) by the Office of Transport and Traffic Planning, 887 km of rail will be laid by 2020. It is expected that when they are completed, it will revamp the provincial rail network and to connect with production bases in rural areas and neighboring countries. SRT also is preparing for high-speed trains to link tourism destinations and reduce time travel in satellite cities by 2020. 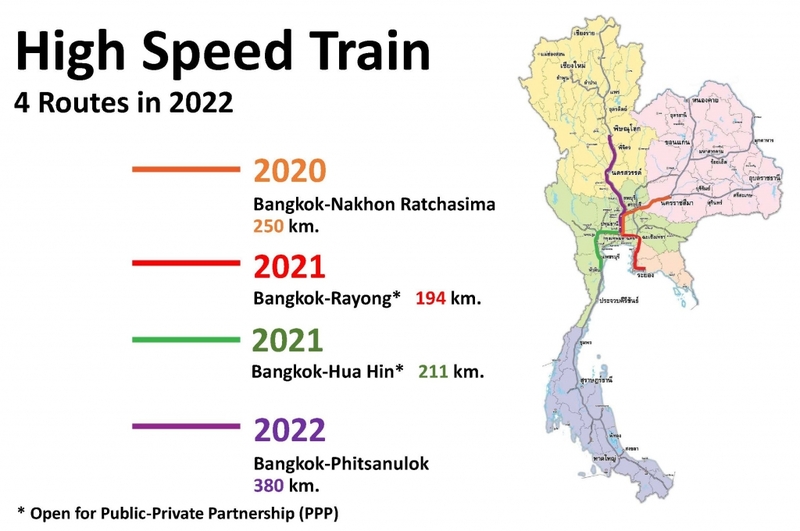 Thai and Chinese authorities are planning to construct a high speed line stretching from the northeastern province of Nong Khai to Bangkok. This high-speed train project consists of four main lines: Bangkok - Chiang Mai; Bangkok - Nong Khai; Bangkok - Rayong; Bangkok - Padang Besar. The total distance will be 1,039 km with speed at 250 km/hr. 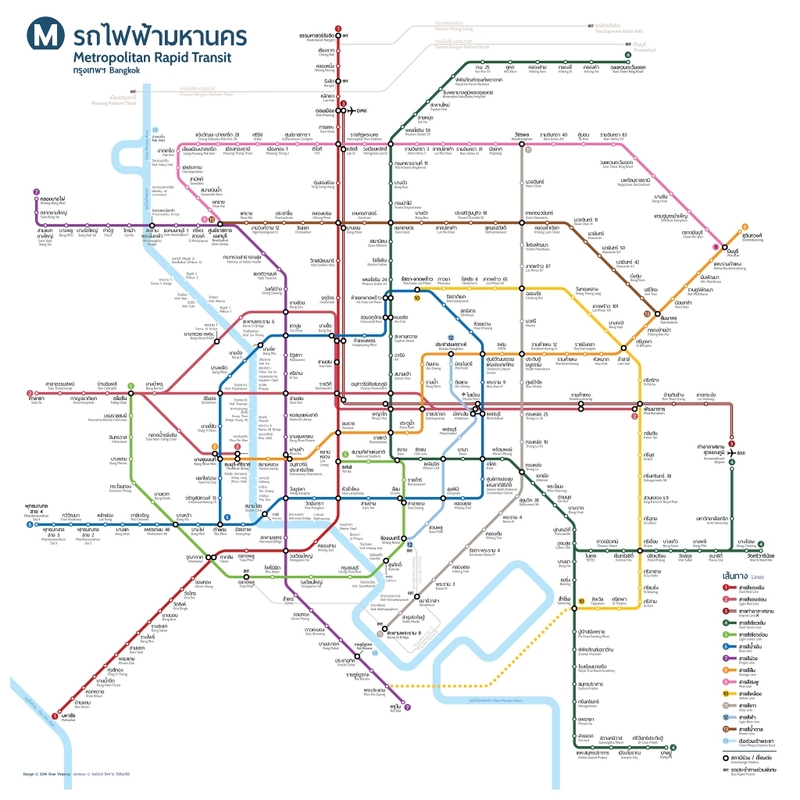 The Mass Rapid Transit in Bangkok consists of five lines in service: the airport rail link, the blue line, the dark green line, the light green line, and the purple line. They cover much of the central city and its many commercial, residential and tourist areas, with extensions planned to outlying areas. The trains run daily between 6:00 am and 12:00 midnight with frequent service throughout the day, which increases during rush hours. The fare is based on the distance traveled. According to Mass Rapid Transit Master Plan, there are 10 lines under construction. They are targeted to to be another 464 km.